This tongue twister Calamagrostis x acutiflora is best referred to as Feather Reed Grass. On a recent trip to Utah I saw it planted in many landscape designs, in front of homes, schools and businesses. It’s striking. The shape is defined, a rectangle. The colors are divided, tan on top, green below. Movement is part of the package with ornamental grasses. Swaying, dipping, billowing, rocking and waving. You don’t get such action with a petunia or juniper. Okay, sometimes flowering cherry trees wave in the wind, but grasses add something extra to the perennial border. This grass is clump-forming and semi-evergreen. It grows in full sun to part shade and does well in many soil types, particularly clay soil. It prefers moist, fertile soil, but will even grow in dry, sandy areas (which is why it’s planted all over Utah). Cold isn’t a problem, it grows in Canada, zones 2 and 3. Cut it all the way down in early spring, just before the new growth begins. The variety ‘Karl Foerster’ is popular for it’s early bloom in June and green leaves. It can reach over six feet in height when in bloom. ‘Avalanche’ and ‘Overdam’ are varieties with variegated green and white foliage. 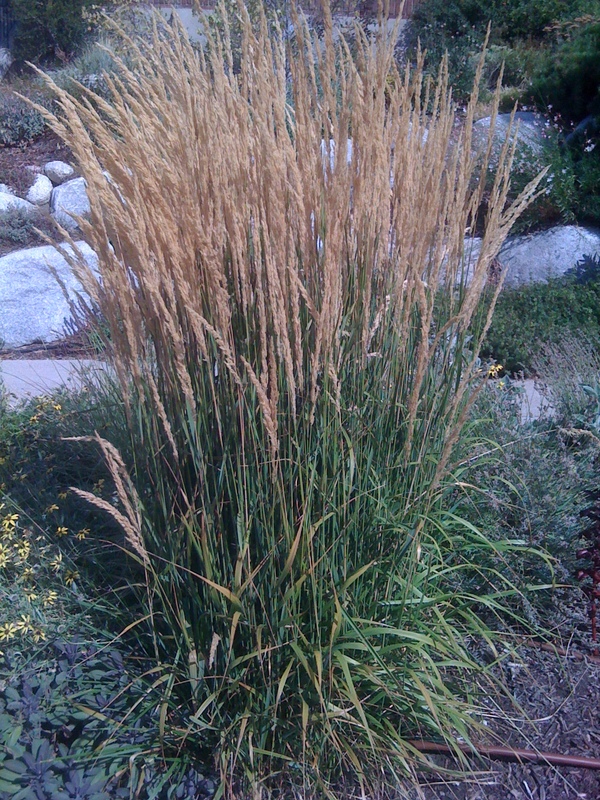 This website bluestem.ca/ornamental-grass from Bluestem Nursery has lots of great reasons to grow ornamental grasses. Some of the reasons I like are: makes a nice rustling sound in the wind, looks good in the fall, and provides a habitat for birds and other wildlife. Check out their site for some great information!